Figures are from the ACR slide collection. 1. Gergely P Jr, Poor G. Relapsing polychondritis. Best Pract Res Clin Rheumatol 2004; 18(5): 723-738. 2. Knipp S, Bier H, Horneff G, et al. Relapsing polychondritis in childhood—case report and short review. Rheumatol Int 2000; 19(6):231-234. 3. Zeuner M, Straub RH, Rauh G, et al. Relapsing polychondritis: clinical and immunogenetic analysis of 62 patients. J Rheumatol 1997; 24(1):96-101. 4. Lang B, Rothenfusser A, Lanchbury JS. Susceptibility to relapsing polychondritis is associated with HLA-DR4. Arthritis Rheum 1993; 36(5):660-664. 5. Hue-Lemoine S, Caillat-Zucman S, Amoura Z, et al. HLA-DQA1 and DQB1 alleles are associated with susceptibility to relapsing polychondritis: from transgenic mice to humans. Arthritis Rheum 1999; 42:S261. 6. Serratrice J, Ene N, Granel B, et al. Severe relapsing polychondritis occurring after ear piercing. J Rheumatol 2003; 30(12):2716-2717. 7. Berger R. Polychondritis resulting from intravenous substance abuse. Am J Med 1988; 85(3): 415-417. 8. Riccieri V, Spadaro A, Taccari E, et al. A case of relapsing polychondritis: pathogenic considerations. Clin Exp Rheumatol 1988; 6(1):95-96. 9. Buckner JH, Van Landeghen M, Kwok WW, et al. Identification of type II collagen peptide 261-273-specific T cell clones in a patient with relapsing polychondritis. Arthritis Rheum 2002; 46(1):238-244. 10. Alsalameh S, Mollenhauer J, Scheuplein F, et al. Preferential cellular and humoral immune reactivities to native and denatured collagen types IX and XI in a patient with fatal relapsing polychondritis. J Rheumatol 1993; 20(8):1419-1424. 11. Buckner JH, Wu JJ, Reife RA, et al. Autoreactivity against matrillin-1 in a patient with relapsing polychondritis. Arthritis Rheum 2000; 43(4):939-943. 12. Valenzuela R, Cooperrider PA, Gogate P, et al. Relapsing polychondritis. Immunomicroscopic findings in cartilage of ear biopsy specimens. Hum Pathol 1980; 11(1):19-22. 13. Yang CL, Brinckmann J, Rui HF, et al. Autoantibodies to cartilage collagens in relapsing polychondritis. Arch Dermatol Res 1993; 285(5):245-249. 14. Hansson AS, Heinegard D, Piette JC, et al. The occurrence of autoantibodies to matrillin 1 reflects a tissue-specific response to cartilage of the respiratory tract in patients with relapsing polychondritis. Arthritis Rheum 2001; 44(10):2402-2412. 15. Hansson AS, Heinegard D, Holmdahl R. A new animal model for relapsing polychondritis, induced by cartilage matrix protein (matrillin-1). J Clin Invest 1999; 104(5):589-598. 16. Stabler T, Piette J-C, Chevalier X, et al. Serum cytokine profiles in relapsing polychondritis suggest monocyte/macrophage activation. Arthritis Rheum 2004; 50(11):3663-3667. 17. Herman JH, Greenblatt D, Khosla RC, et al. Cytokine modulation of chondrocyte proteinase release. Arthritis Rheum 1984; 27(1):79-91. 18. Michet CJ Jr, McKenna CH, Luthra HS, et al. Relapsing polychondritis. Survival and predictive role of early disease manifestations. Ann Int Med 1986; 104(1):74-78. 19. McAdam LP, O'Hanlan MA, Bluestone R, et al. Relapsing polychondritis: prospective study of 23 patients and a review of the literature. Medicine (Baltimore) 1976; 55(3):193-215. 20. Trentham DE, Le CH. Relapsing polychondritis. Ann Int Med 1998; 129(2):114-122. 21. Tillie-Leblond I, Wallaert B, Leblond D, et al. Respiratory involvement in relapsing polychondritis. Clinical, functional, endoscopic, and radiographic evaluations. Medicine (Baltimore) 1998; 77 (3):168-176. 22. Tsunezuka Y, Sato H, Shimizu H. Tracheobronchial involvement in relapsing polychondritis. Respiration 2000; 67(3):320-322. 23. Isaak BL, Liesegang TJ, Michet CJ Jr. Ocular and systemic findings in relapsing polychondritis. Ophthalmology 1986; 93(5):681-689. 24. Balsa A, Expinoza A, Cuesta M, et al. Joint symptoms in relapsing polychondritis. Clin Exp Rheumatol 1995; 13(4):425-430. 25. Buckley LM, Ades PA. Progressive aortic valve inflammation occurring despite apparent remission of relapsing polychondritis. Arthritis Rheum 1992; 35(7):812-814. 26. Lang-Lazdunski L, Hvass U, Paillole C, et al. Cardiac valve replacement in relapsing polychondritis. A review. J Heart Valve Dis 1995; 4(3):227-235. 27. Michet CJ. Vasculitis and relapsing polychondritis. Rheum Dis Clin North Am 1990; 16(2): 441-444. 28. Frances C, el Rassi R, Laporte JL, et al. Dermatologie manifestations of relapsing polychondritis. A study of 200 eases at a single center. Medicine (Baltimore) 2001; 80(3):173-179. 29. Orme RL, Nordlund JJ, Barich L, et al. The MAGIC syndrome (mouth and genital ulcers with inflamed cartilage). Arch Dermatol 1990; 126(7):940-944. 30. Letko E, Zafirakis P, Baltatzis S, et al. Relapsing polychondritis: a clinical review. Semin Arthritis Rheum 2002; 31(6):384-395. 31. Hanslik T, Wechsler B, Piette JC, et al. Central nervous system involvement in relapsing polychondritis. Clin Exp Rheumatol 1994; 12(5):539-541. 32. Damiani JM, Levine HL. Relapsing polychondritis—report of ten cases. Laryngoscope 1979; 89(6 Pt 1):929-946. 33. Foidart JM, Abe S, Martin GR, et al. Antibodies to type II collagen in relapsing polychondritis. N Engl J Med 1978; 229(22):1203-1207. 34. Kraus VB, Stabler T, Le ET, et al. Urinary type II collagen neoepitope as an outcome measure for relapsing polychondritis. Arthritis Rheum 2003; 48(10):2942-2948. 35. Krell WS, Staats BA, Hyatt RE. Pulmonary function in relapsing polychondritis. Am Rev Respir Dis 1986; 133(6):1120—1123. 36. Behar JV, Choi YW, Hartman TA, et al. 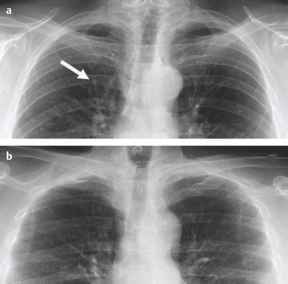 Relapsing polychondritis affecting the lower respiratory tract. AJR Am J Roentgenol 2002; 178(1):173-177. 37. Miyazu Y, Miyazawa T, Kurimoto N, et al. Endobronchial ultrasonography in the diagnosis and treatment of relapsing polychondritis with tracheobronchial malacia. Chest 2003; 124(6): 2393-2395. 38. Heman-Ackah YD, Remley KB, Goding GS Jr. A new role for magnetic resonance imaging in the diagnosis of laryngeal relapsing polychondritis. Head Neck 1999; 21(5):484-489. 39. Imanishi Y, Mitogawa Y, Takizawa M, et al. Relapsing polychondritis diagnosed by Tc-99m MDP bone scintigraphy. Clin Nucl Med 1999; 24(7):511-513. 40. Mark KA, Franks AG Jr. Colchicine and indomethacin for the treatment of relapsing polychondritis. J Am Acad Dermatol 2002; 46(suppl 2 Case Reports):S22-S24. 41. Lipnick RN, Fink CW. Acute airway obstruction in relapsing polychondritis: treatment with pulse methylprednisolone. J Rheumatol 1991; 18(1):98-99. 42. Ruhlen JL, Huston KA, Wood WG. Relapsing polychondritis with glomerulonephritis: improvement with prednisone and cyclophosphamide. JAMA 1981; 245(8):847-848. 43. Ormerod AD, Clark LJ. Relapsing polychondritis—treatment with cyclosporin A. Br J Dermatol 1992; 127(3):300. 44. Mpofu S, Estrach C, Curtis J, et al. Treatment of respiratory complications in recalcitrant relapsing polychondritis with infliximab. Rheumatology (Oxford) 2003; 42(9):1117-1118. 45. Saadoun D, Deslandre CJ, Allanore Y, et al. Sustained response to infliximab in 2 patients with refractory relapsing polychondritis. J Rheumatol 2003; 30(6):1394-1395. 46. Tyndall A. Hematopoietic stem cell transplantation in rheumatic diseases other than systemic sclerosis and systemic lupus erythematosus. J Rheumatol Suppl 1997; 48:94-97. 47. Sarodia BD, Dasgupta A, Mehta AC. Management of airway complications of relapsing polychondritis: case reports and review of the literature. Chest 1999; 116(6):1669-1675. 48. Spraggs PD, Tostevin PM, Howard DJ. Management of laryngotracheobronchial sequelae and complications of relapsing polychondritis. Laryngoscope 1997; 107(7):936-941. 49. Del Rosso A, Petix NR, Pratesi M, et al. Cardiovascular involvement in relapsing polychondritis. Semin Arthritis Rheum 1997; 26(6):840-844. 50. Biro P, Rohling R, Schmid S, et al. Anesthesia in a patient with acute respiratory insufficiency due to relapsing polychondritis. J Clin Anesth 1994; 6(1):59-62.